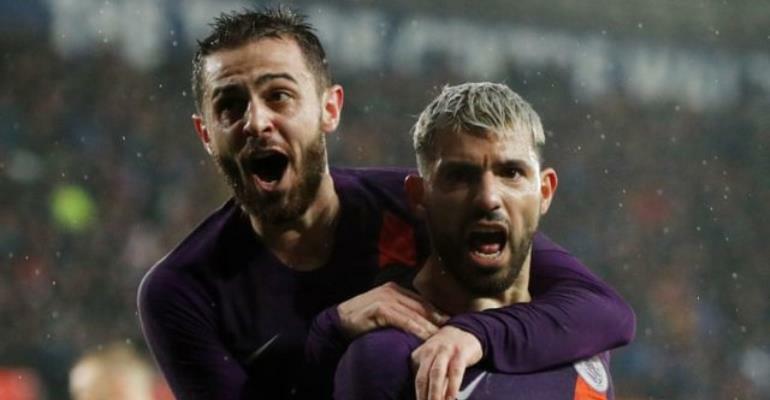 Premier League leaders Manchester City recovered from two goals down to beat Championship side Swansea City 3-2 at the Liberty Stadium on Saturday to progress to the FA Cup semi-finals. Having secured a last-eight spot in the Champions League to go with their League Cup title, City made a strong start as they looked to continue their quest to become the first side to win all four major trophies in an English season. However, they were opened up after 20 minutes by Connor Roberts who drew a foul from Fabian Delph in the penalty area and Matt Grimes converted from the spot to give Swansea the lead. The Premier League side struggled to break Swansea down after the break, but Bernardo Silva's goal in the 68th minute got City back in the match. From then on in it was all Manchester City and an own goal off the back of Swansea goalkeeper Kristoffer Nordfeldt after substitute Sergio Aguero's 77th-minute penalty had come back off the post leveled the tie. Aguero missed a glorious chance to score seven minutes from time, but the Argentine striker had the final say when he headed the winner two minutes from time.